So, to recap part one, our first night in France was marked by rain. Lots and lots of rain. But happily the Brittany weather cheered up from there and climbed through the 2o’s to reach 30 degrees by the end of the week. 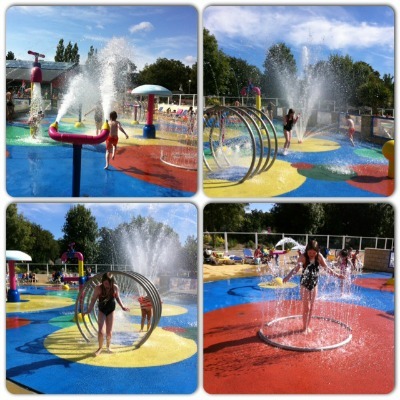 And how did Siblu’s Domaine de Kerlann holiday village hold up in the heat? For starters, our mobile home was great – comfy beds, well-equipped kitchen, plenty of hot water for the shower, barbecue and nice outside area to sit in. The kitchen had a fridge-freezer, oven, microwave big enough to double up as an extra bedroom and plenty of sharp knives. It’s amazing how many self catering places are lacking in the sharp knife department. Each mobile home at Domaine de Kerlann is set in its own area with at least one parking space and separated from its neighbours by 5-6 foot hedges. So you do have your own privacy, though the walls are thin so avoid screeching if you can – I had no choice but to earywig on our neighbours’ heated debate on the etiquette of bringing wine to a dinner party (It’s a gift for the host! No, it’s to drink with the meal!). 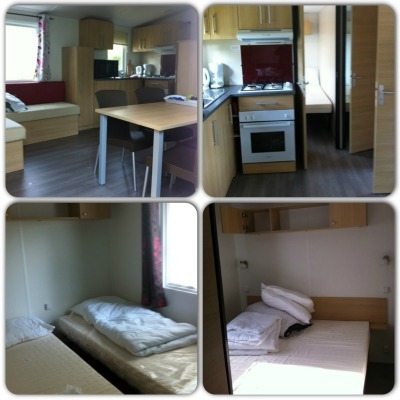 This mobile home is an Esprit Plus – the park offers 3 types of accommodation. It’s a step up from the most basic and all in all it suited our needs well. 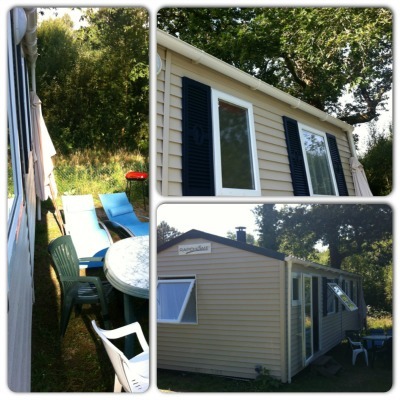 As we were on a review trip, our accommodation was provided by Siblu, but I note from the booking form that to hire this mobile home for the week we were there (August high season) would have been around £1000. So comparing that to previous self catering holidays we’ve had, it’s more than Wales, about the same as Cornwall and less than Center Parcs. And if you’re not stuck to school holidays you can strike a serious bargain – hiring a mobile home like this in September starts from only £205. Wowsers. What a bargain. I’m going back. We were at the furthest end of the park, but it was still no more than 10 minutes’ walk to the centre. Which is where the fun starts. These range from toddler-friendly ankle skimmers, to a deep outdoor pool. They don’t serve food or drink by the pool, and have a very strict no shoes policy, which means that the area itself stays clean and litter free. There are several of these dotted around the site, and the safe, family-friendly atmosphere meant I was happy for my children to wander off by themselves to play. This was open from around 8 to 12 every morning, meaning you could have fresh croissants and baguettes for breakfast. As it was high season, it also opened for an hour in the evening. This shop was good for the basics, plus their 3.95 Euro wine was not bad at all. Hic. We didn’t use these because our children’s ages meant they would’ve had to go into separate clubs, but it’s a good facility if you want to use it. With a choice of archery, basketball, mini golf, boules, tennis, football, cycling and volleyball. There was an indoor and outdoor stage with live shows every night, but by this point we were usually back at our caravan drinking wine – I had an 800 page novel to get through. We could hear the music drifting through the trees but it wasn’t loud enough to be intrusive. The impression we were left with from Domaine de Kerlann was that you can have as busy or quiet a time as suits your family – either pack the day with sports and activities, or chill out by the pool, or a combination of both. There’s no pressure to join in with anything you don’t want to. The bilingual staff are friendly but won’t bug you to sign up for stuff. Most of our days involved a trip out somewhere, then a session of swimming and relaxing by the pool from 5pm until it closed at around 7pm. We found that the pool was less busy at this time and the worst heat of the day had passed. The pool area itself had a nice atmosphere to it. The sound system played cheesy Europop – not so loud that it was intrusive, it just added to the holiday vibe. Although on one memorable occasion the playlist went a bit wrong and cheerfully supplied F*** It By Eamon, which holds the Guinness World Record for the most expletives in a Number One track. Oh how we hooted at that. But the fact that nobody else appeared to notice shows you that the music isn’t terribly loud. Now, lots of people have asked me about the Speedo question. Anyway, the answer is – no, you don’t have to wear Speedos. Loose swim shorts will do just as well. Though if you do want to wear Speedos, you’ll have many friends to join you. Likewise with bikinis – they were much more popular than one piece swimsuits with women of all shapes and sizes. Not with me though. I’m keeping the swimsuit faith. 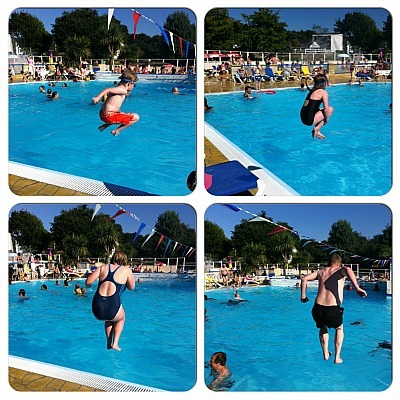 Jumping into the pool featured heavily on our holiday. After our session in the pool we would walk over to the bar, where the rest of the family played a different kind of pool and I would alternate between reading my book (800 pages, remember? I can’t go taking time off to play pool), slurping wine and watching the Olympics on the big screen. Surprisingly, the on-site bar was pretty empty most nights we were there. Where was everybody? Were they all having a better party elsewhere and forgot to invite us? Maybe people were waiting until the live entertainment started. Maybe they had an 800 page novel to read and didn’t want to get distracted by the Olympics. All in all, it was a fun and relaxing time, friendly atmosphere and lovely surroundings. Would we recommend it? Oh yes, 100%. Would we go back again? Like a shot. So I hope that’s given you a good overview of what to expect at Siblu’s Domaine de Kerlann. But what is there to do once you step outside the holiday village? Is this as good as it gets? Find out in the next post.